Art supplies always end up in the mouth. So the obvious choice is to get non-toxic crayons for toddlers if you prefer crayons. Now despite the drawbacks for you, like having to scrub all the surfaces your kid decides to draw on, the cognitive benefits for your child’s development far outweigh the demerits. For example, the cognitive skills applied when learning to recognize colors, like motor skills, are the same skills your toddler will need when he or she gets to preschool. Your main concern is thus in getting art supplies that aren’t messy (crayons are not as messy as other supplies), non-toxic, while still achieving the very basic function of encouraging cognitive development, i.e they should be just as effective as the toxic ones. 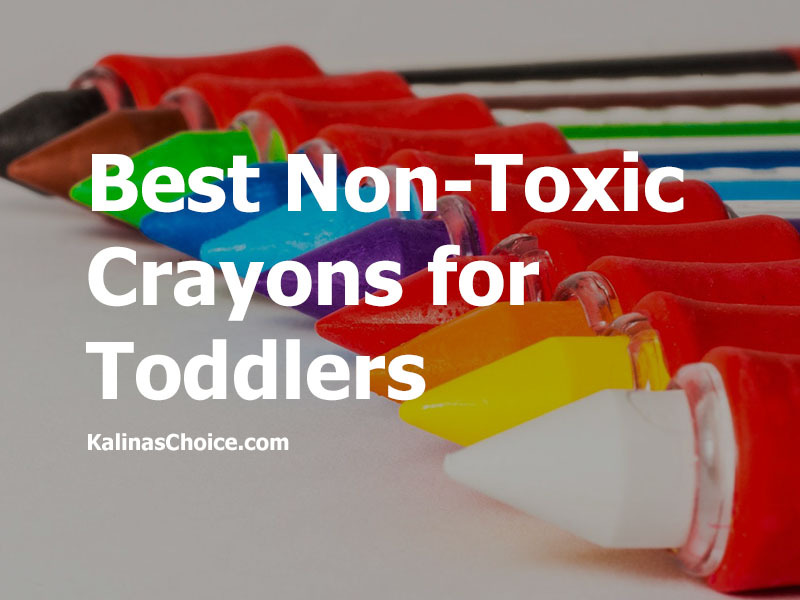 How Effective Are Non-Toxic Crayons For Toddlers? This is made in New Zealand and is handmade with 100% natural beeswax. Since they’re handmade, they are sustainable and have a low impact on the environment. So they aren’t as exposed to some of the toxic processes as other baby crayons go through. Remember that beeswax is very sturdy, after several testings on preschoolers and older kids, who tried biting and throwing around, they endured. It’s 55 mm long and 20 mm wide, which is a great fit for toddlers. You probably grew up using Crayola so it shouldn’t be a surprise that it made our list (3 times). It’s egg-shaped so toddlers can hold it better. They’re also big enough so they don’t pose a choking hazard, unlike other smaller shaped baby crayons. They’re also meant to outlast toddlerhood. See some of our non-toxic baby toys picks. The egg shape seems like a taunt to kids, so parents complain that kids spend more time throwing it than actually using it to color. This comes as a pack of 12 colors. It has been CE approved and EN71 certified as non-toxic. Even though it has 12 colors, they seem to be in pairs, so you might as well have 6 colors. There are also no dark hues, so there’s a limit to what you can paint. Even though it poses a choking hazard, there are tiny hole pass-throughs to limit the severity of a choke and to provide sufficient time for first aid. This crayons comes in a durable casing of 12 vibrant colors. It’s made with Beeswax, but the manufacturer doesn’t indicate what % is actually beeswax. 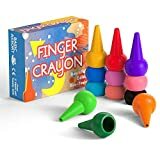 Its colors are also more vibrant than should be expected of organic crayons so it’s possible that there are additional ingredients that are inorganic. It conforms to ASTM D-4236. So it doesn’t have chronic side effects. It’s the cheapest crayon on our list, so if you’re looking for an affordable non-toxic crayon for toddlers, you should get this. This is our budget-friendly Crayola option and it comes as a pack of 24 colors. It was made in the US, so it has gone through the necessary regulatory standards necessary. Most of the recalls are from crayons made in China. Unfortunately, it isn’t washable like our other budget option. While this isn’t Crayola technically isn’t a crayon, it’s a marker, it makes it into our list because kids can’t eat markers. It comes in a package containing two 30 page wonder pads, with 20 markers; 10 of which are classic and the other 10 bright colored wonder mini markers. The beauty of the markers is that the colors only appear on the wonder paper pad. It’s the most expensive product on this list, but it comes as a package so that’s understandable. Apparently, if you have a couch with somewhat similar material as the wonder pad, you’ll end up with doodles all over. This is a water drawing mat. It’s perhaps the most innovative on our list. It can be folded into a compact size and moved about. Pens are water filled and only usable on the mat so won’t leave any mess. Paintings disappear after 3 – 10mins, depending on the temperature, so you can store the paintings as memories (unless you take photos after every drawing). We also did a review of non-toxic play mats for baby’s. Crayola estimates that by age 10, the average kid would have used up to 730 crayons. Most toxicologists will tell you that “the dose makes the poison”. So consuming almost anything in excess can be poisonous. For example, eating up to 500 bananas (not a dare, but I doubt any reasonable person can do that) in a seating will raise the potassium in your blood to fatal levels. The problem with crayons is that some of the chemicals used are toxic even in what might seem to be insignificant amounts. For example, a research paper published in the American Journal of Public health found that certain types of dyes used in crayons resulted in methemoglobinemia (oxygen isn’t carried to cells effectively). In fact, the effect was so prominent that 10 more cases of methemoglobinemia from ingesting crayons were reported to the author after the paper was published. This was in the 1940s, so a lot of manufacturers have learned to use other non-toxic pigments. (Note that there isn’t a strict definition of non-toxic, so companies can say they use natural pigments but it will be up to you to note the actual ingredients). Still, in 1994, there were recalls from a lot of the main crayons brands, primarily from China, due to the presence of lead in them. Illinois’ poison center states that if a child eats a mouthful of a lead-containing crayon over a little span of time, he or she would have exceeded the lead poisoning threshold. Again, this was over two decades ago, so there are now many testings in place for a lead in crayons before they reach the public. Nevertheless, a study, as recent as 2015, found traces of asbestos, known for being carcinogenic, in four of the crayon brands tested. Your best bet is to buy from that firms have gone through regulatory testings, and have “conform to ASTM D-4236”, which is proof that it has been reviewed by independent toxicologists for chronic hazards. They may have used only a little quantity, like 10%, which won’t matter if the other 90% is inorganic. Soy wax isn’t necessarily organic if the soybeans used isn’t non-GMO certified, hence it may contain traces of pesticide. Remember to check for additives. Organic products tend to have shorter shelve lives, so organic crayons with long lifespans should be suspicious. How well do they perform against their more “toxic” counterparts? Note that paraffin wax (used in making crayons and candles) is considered more toxic, not because the wax (a petroleum by-product derivative) itself is toxic, but because the process it goes through leaves toxic residues. How Well Are The Color Markings? Plant-based waxes and pigments, when used to make crayons, don’t give off the same bold vibrant colorings as crayons made with paraffin wax. You should keep in mind that at this stage, toddlers aren’t necessarily art majors, so as long as the colors work, they are a much safer option than their toxic counterparts. Some crayons will break just by looking at them. And Kids are kids, so they’ll stomp, throw and bite the crayons, then cry when it breaks and wonder why you can’t fix it. So how well they withstand pressure is important. Beeswax, made from honeycomb, are quite tough, and depending on the process used, won’t brittle. Soy wax can be used as well, but they aren’t as tough. Carnauba wax, made from the leaves of Brazillian palm trees, is the hardest amongst all 3, but they brittle the most. Of course, if you’re concerned about the deforestation effects of using Carnauba leaves, you can opt for other natural waxes. Does It Wash Off Easily? Kids will write everywhere, except where they’re supposed to. The best non-toxic crayons wash off. However why the wash off is usually trade secrets so you likely can’t tell if they include chemicals or use processes that are toxic. You’d have to take their word. Because your child safety is more important than anything else, you have to ensure that you aren’t knowingly endangering your child. The products reviewed here are classified into; our pick, the least toxic crayon which doesn’t compromise on effectiveness, runner-up – great but is less effective, Bang for the buck – get your money’s worth, budget and Also great – not necessarily crayons, but are non-toxic. Coloring has undeniable developmental benefits which far outweigh the cons. So they’re going to be part and parcel of your child’s life, from a very tender age. An experimental age where everything is considered edible. It’s thus your parental duty to ensure baby isn’t consuming art supplies that are hazardous. 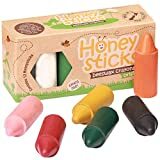 So far you’ve seen our best non-toxic crayons for toddlers, specifically our pick, the Organic Honeysticks 100% Crayon. We’ve noted that while organic crayons aren’t as vibrant as inorganic crayons, but toddlers using these crayons aren’t trying to paint masterpieces, so their health is a greater priority compared with the art they create. Considering the toxins your child will probably come across in an increasingly unsafe environment, using non-toxic crayons are one of the few safety measures within your control.